Where do the buildings connect? Do I need to reserve a wheelchair before my visit? Can I rent an electric scooter or wheelchair? Where can I find live animals in the Museum? Where is “Meet the Animals”? 1. What is the NEC? 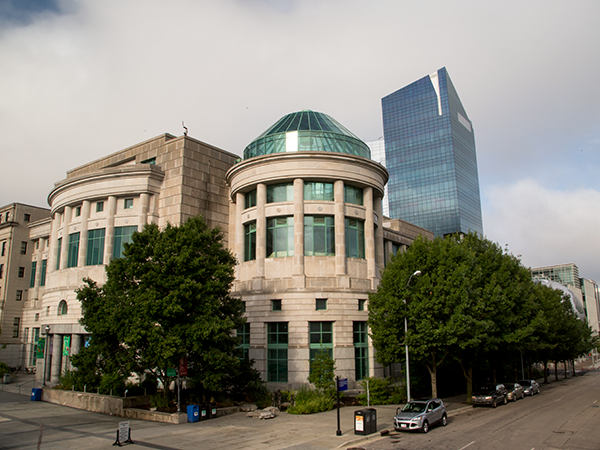 The NEC is the acronym for the Nature Exploration Center, located at 11 West Jones Street. It is the older of the two buildings that make up the main campus. If you see escalators, you know you’re in the NEC. 2. What is the NRC? 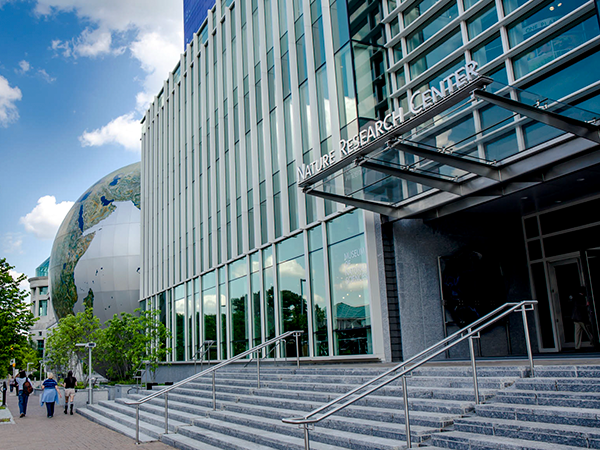 The NRC is the acronym for the Nature Research Center, the new 80,000-square-foot building. Its goal is to bring research scientists and their work to the public eye. If you see a glassed in research lab, you know you’re in the NRC. 3. Where do the buildings connect? The Nature Exploration Center and the Nature Research Center are connected by an indoor bridge on the 2nd floor of both buildings, and an outdoor bridge on the 3rd floor of both buildings. Parking is available weekdays in several public pay parking decks within walking distance of the Museum. Parking rates at all Downtown State Government Complex parking facilities are currently $2/hour. Limited metered parking is available along Jones and Edenton Streets. Parking is free and abundant on weekends and evenings after 5pm. 5. Do I need to reserve a wheelchair before my visit? No. There are plenty of wheelchairs available in either building and are distributed on a first-come, first-served basis. 6. Can I rent an electric scooter or wheelchair? Unfortunately, we do not offer electric scooters or wheelchairs for rent. However, manual wheelchairs may be checked out at our front desks, free of charge. 7. Are strollers allowed in the Museum? Yes, you may bring your stroller into the Museum. Some areas of the Museum, such as Windows on the World and the Living Conservatory, may ask that you leave your stroller outside of their space. 8. Where can I find live animals in the Museum? Live animals can be found throughout both buildings. Highlights include snakes, which can be found on the 3rd floor of the Nature Exploration Center and the 2nd floor of the Nature Research Center. On the 1st floor of the NRC there is a 10,000-gallon aquarium that features a variety of native fishes. The Living Conservatory on the 4th floor of the NEC houses a tarantula, a milk snake, turtles, butterflies, and a two-toed sloth. 9. Where is the gift shop? We have three gift shops. The main Museum Store is located on the 1st floor of the NEC behind the front desk and to the left. The Exhibition Store is associated with the Featured Exhibition Gallery on the 2nd floor of the NEC. The Center Store is located on the 1st floor of the NRC next to the Daily Planet Café. 10. Where are the butterflies? Live butterflies are located on the 4th floor of the NEC in the Living Conservatory. 11. Where are the dinosaurs? Our dinosaurs are located on the 3rd floors of the NEC and NRC. 12. Where is “Meet the Animals”? The daily “Meet the Animals” program is located in our Windows on the World theater on the 3rd floor of the NEC.